How stunning does Kajol look in that black and pink combo! I like them all. I like how everyone is dressed like they are attending someone else’s wedding and not their own. Classy! I wish Kajol would wear saris more often . Her full figure looks so good in it. In the same way, I was thinking Aishwarya should be invited for a celeb wedding down South. And I want to see what she wears to it. Her usual blingy AJSK, MM, Sabya or a lovely handloom. All of them look good. 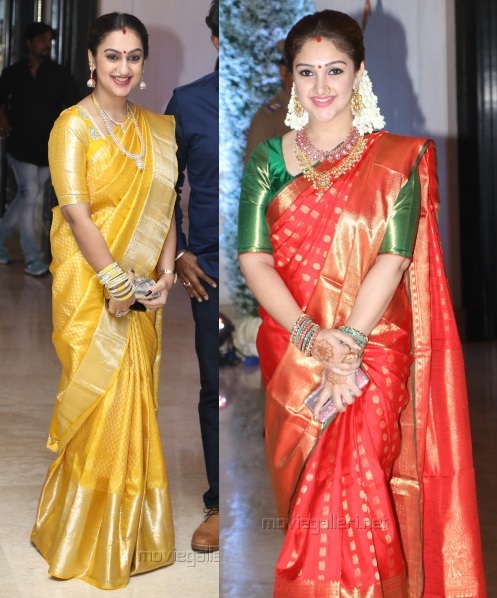 Sridevi Vijaykumar and Preetha always wear beautiful sarees, beautiful jewellery, beautiful blouses and are beautifully dressed always. They all look fantastic. 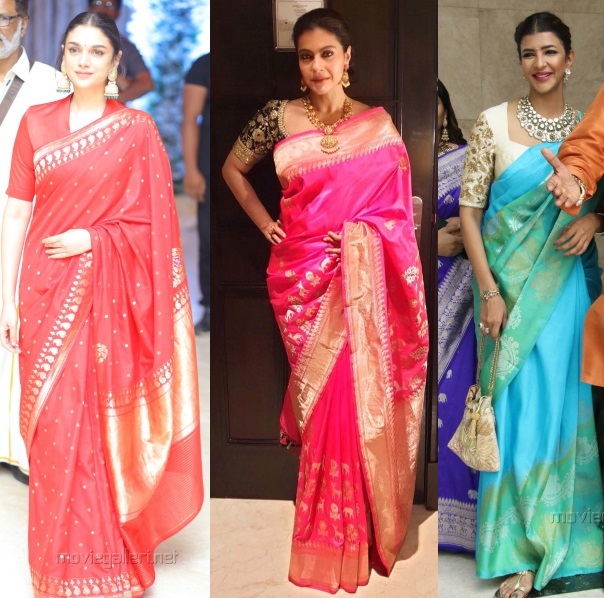 Love Kajol’s and Aditi’s sarees. They represented Bollywood very well here :) Its so good to see beautiful sarees, draped perfectly and guests looking like guests at someone’s wedding. Love them all! What a palette cleanser. Love Kajol’s black blouse…very beautiful. Can someone ID it? Aditi, hands down for me. Minimal best. For the first time I can say Kajol looks great. Aditi looks good and shows how you can look dressy without heavy necklaces. That blue sari is stunning. That black and pink combo on Kajol looks strange. Aditi is perfection here. My eyes keep getting drawn back to her, even when I try to look at the others.